Shree Govardhandharan Shree Shreenathji ordered Shreemad Acharya Mahaprabhuji Shree Vallabhacharyaji to place him in temple i.e. Mandir and start the seva. At that time, Shree Mahaprabhuji constructed a small temple and placed Shreenathji and started the seva of shree prabhu. On V.S 1556 Vaishakh Shukla (Vraj) 3 Akshay Trutiya, a new big temple was ready to shift the swaroop. Shreenathji was placed in the new temple on this day. After that, once Shreenathji expressed desire and ordered Shree Gusaiji to go to the residence of his seven sons at 'Satghara' Mathura. The 'Satghara' at Mathura was built by Queen of Gadha Rani Durgavati. Thus, on the day of V.S. 1627 Faagan Krishna 7 Thursday, Shreenathji arrived at 'Satghara' and all Goswami Balaks celebrated as a grand festival in the occasion of arrival of Shreenathji at their home. In celebration of this, they observed the holy 'Patotsav' of Shreenathji with grand fervor and enthusiasm and thus since all seven sons celebrated this utsav, in entire pushtimarg, this utsav began to be celebrated as the 'Patotsav' of Shreenathji. Today all goswami balaks (aged and young all), bahujis, and betijis plays Hori with Shreenathji and another importance and incident on this day was "Sarva Samarpan' of Shree Giridharlalji (Eldest son of Shree Gusaiji) to the Lotus Like Feet of Shreenathji for apshri's arrival at his house. 1. Raas Panchadhyayi: After the Gopigeet, Shree Prabhu re-appeared before Shree Gopikas. After the darshan, Shree Gopikas made Shree Prabhu to sit on Sihasan i.e. "PAAT". 2. Shree Sudama also made Shree Prabhu sit on 'Pat' when Shree Prabhu visited his home. 3. 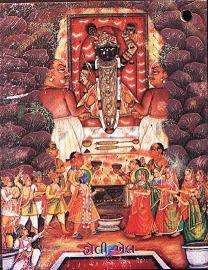 Dharmaraaj Yuthisthira, in Rajsuya Yagya, made Shree Prabhu to sit on throne and did the poojan. Thus with all the above bhavas, 'Patotsav' was started to be celebrated. At Shree Nathdwara, there is no 'Sihasan' but instead their is a 'Chowtari Chowki' which is considered as 'Paat'. All other Gruhs of Pushtimarg have 'Sihasan' but instead in Shreenathji, their is a 'chowki'. During Hindola also, there is only chowki and no sihasan. Why 'Patotsav is celebrated on Krishna Saptami? Shreenathji is the swaroop with 6 dharmas i.e. Shree ,Gyaan etc and seventh the dharmi himself Shreenathji. The queen of 'Gadha' Rani Durgavati constructed a huge palatial mansion for all seven sons of Shree Gusaiji. This mansion is known as 'Satghara' i.e. mansion where seven sons stays.Before the first stay of all balaks in this mansion, all seven sons welcomed shreenathji to reside their home at mathura satghara and they earned the blissful play of holi with Shreenathji. This was on Krishna Saptami. At this time, Shree Giridharlalji (Eldest son of Shree Gusaiji displayed a very unique and strong bhav of devotion towards Shreenathji and surrendered all his laukika and alaukik belonging to shreenathji as a gift to shreenathji for apshris first arrival at thier home. This came to be known as "Sarva Samarpan" in pushtimarg. Thus today is a very important day and utsav and is celebrated as a 'Mahotsav' in all Seven gruhs of pushtimarg. 1. This utsav is celebrated as a 'Mahotsav' in all seven gruhs of pushtimarg. 2. Today, in entire pushtimarg, the bhavna of Shreenathji is done and holi is played with Shree Prabhu and various different new samagris are offered to Shree PRabhu. 3. From today, the idols of human, devas,gandharvas, kinnaris are made to dance before Shreeji so as to make Shree PRabhu happy. Dhan Dhan Nand Yasomati, Dhanya Shre Gokul Gaam !! The meaning of the above kirtan is two/multifold. 2. Hori Khel with Shreenathji Nitya Leela. From the 108 days, only from today, the 'Mojaji' are taken away and thus darshan of "Shree Charan"s can be done. From today, the musical instrument named 'Upang' is played. Today all Goswami Balaks, Bahujis and Betijis plays hori with Shreenathji with Abir, Gulal, Chova and Chandan.